Cool… my friend having a small concert in “Red box” sing from 12 pm till 6 pm… bravo bravo friend…you guys really have great stamina oh… too bad i can’t join but I was around that area as I send my wife for medical check up and have to wait few hours, so I go to Sunway Pyramid to get movie “Harry Potter and the Order of the Phoenix” as is it my wife favorite movies. She has all the novel of the Harry Potter but is in mandarin…. 🙁 too bad i can’t read mandarin. Actually I’m thinking of learning mandarin….if i got free time as kinda miss out when friend go to karaoke mostly they sing mandarin songs….some songs i do know how to sing….but very very little then. Hmm… how long does it takes to learn then? How long and how soon you can master it is how discipline and concentrate you are, right? “Transformers” movies still selling likes hot cakes as I saw the show times only left 12:10 am…wow… how to get the tickets then… have to purchase few days in advance i think. I only manage to get the “Couple Seat” ticket as the normal ticket is 3rd & 4th row from the screen, how to watch if that near….you will feel dizzy. 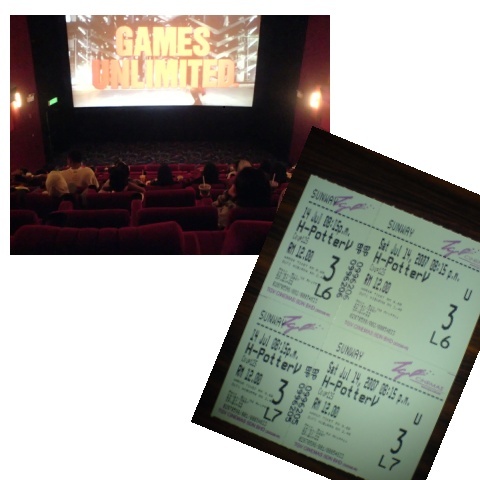 I remember 2 years ago, during CNY 16 of us going for movies and manage to get seat in the 1st row…fantastic view man…. after the movies…all started to !$$#$(@&#&&%@# !!! the worst thing is pain in the neck… good experience too. TGV in Pyramid have move to new premises, where is just above the existing old floor. I think is using the new building area if not mistaken, the new outlook is much more clean and ticket counter is more easy to see where is your seat. I took a snapshot of how it look inside the cinema as the new seating now is very steep compare to last time and you hardly see other ppl head. The “Couple Seat” still not that confortable compare to GSC couple seat as it has the head rest where TGV does not have, but it is spacious…he he he easy to hug around.